With over a decade of experience, Gazeboshop has grown to become one of the largest and most respected suppliers of pop up gazebos, instant shelters and mini marquees to the event, exhibition, motorsport and leisure industries throughout the UK and Europe. Often, customers approach us unsure which gazebos are best suited to their needs, having spent hours trawling through supplier lists and websites for frame comparisons, and need help deciding which gazebo is right for them. Unknown to them, many factors need to be considered before purchasing pop up gazebos and the choice they make when buying a frame will be dependent on what they will be using the gazebo for and how often. So instead of spending hours online, why not get in touch with our experienced sales team today – we are here to help! We can provide you with the information you need on our gazebos to make an informed choice for your business. How often and what you intend to use your gazebos for, and in what type of weather conditions. The gazebo’s weight, as this impacts on the ease of operation and transportation. How exposed the site is and if you intend to erect gazebos on hardstanding ground, either steel stacking or sand bag leg weights will be required. Our range of gazebos is unrivalled when it comes to quality, reliability and value for money. We offer robust, high quality gazebos and with four grades of frame strength, various sizes and a multitude of colours to choose from, there really is something to suit all uses and budgets. All of our gazebos are made from the very best components to ensure long lasting satisfaction. They are quick and easy to set-up and can be collapsed down to a portable size for ease of transportation. Our versatile gazebos can be supplied with or without walls, giving you instant shade or sheltered protection from the British weather! Pop up gazebos offer the ideal solution for any corporate, promotion or business event and can be used for a variety of uses including promotional stands, shading at sports events, trade show stands, market stalls and motorsport race meetings. Recommended for regular summer and light winter use, our robust Heavy Duty Steel and Prolite Aluminium gazebos make for perfect entry level shelters. Our Heavy Duty Steel range are made from durable, high-quality carbon steel and can be set up in 60 seconds. These gazebos are suitable for a variety of leisure and promotional uses and have a proven track record with many motorsport clubs, charity fundraisers, schools and sports clubs to name a few. For ease of operation and transportation and if frame weight is an important factor then take a look at our Aluminium Prolite range. These gazebos are stronger yet comfortably lighter than the equivalent sized Heavy Duty Steel Gazebos, making them the most mobile gazebos in our product range. If you are short on storage space or limited by space during transportation our Compact range of gazebos offer you the ideal solution. Available in either high-quality carbon steel or multi ribbed anodised aluminium, our range of folding, compact gazebos offer high-end performance despite their budget price. These gazebos are highly portable, and conveniently pack down small enough to fit into the boot of a small car. A step-up model from these gazebos is one of our best sellers – the Aluminium Extreme 40 Series. Renowned for its quality design and build, this mini marquee range is a great choice for any user looking for a professional, strong and reliable unit. These gazebos are recommended for use all year round in either a professional setting or on a commercial basis. Its unique multi ribbed tubular construction and high grade of aluminium make it one of the strongest gazebos on the market. With 57mm hexagonal legs, our Aluminium Extreme 50 Series pop up gazebos offer extreme strength and durability all year round. This robust range of gazebos is one of the strongest commercial grade pop up gazebos in Europe. The frame comes fully assembled and is constructed from tough anodised aluminium with reinforced aluminium cross bars. Unsurprisingly our 50 Series gazebos are built to last and are capable of withstanding most weather conditions. Furthermore, all of our gazebos come with a manufacturer’s warranty of up to three years and our gazebos are 100% waterproof, UV stable and flame retardant. Their ‘pop up’ design means they are quick and easy to set-up and all frames come fully assembled with no loose parts. All parts used in our gazebos are replaceable, with spare parts for our gazebos readily available from stock for next working day delivery. We also offer to add on accessories for our gazebos – customers can choose from a wide range of gazebo accessories, including folding trestle tables, leg weights for gazebos, tie down kits, gutters, printed banners and flags tailoring their gazebos to their own requirements. Gazeboshop prides itself on having the highest quality manufactured gazebos, supported by great customer service, print and fast delivery. We have built our reputation on delivering quality products with fast turnaround times, first class customer service and market leading warranties on all of our gazebos. We operate from centrally located offices in Banbury, making us conveniently located for the M40 corridor, with good transport links to Birmingham (45 mins), London (1 hour) and Oxford (30 mins). Over the years, we have supplied many well-known high profile organisations with pop up gazebos, including Coca Cola, the BBC, British Army, Stroke Association, High5, Nandos, Sainsbury’s and St John Ambulance as well as many individuals from independent businesses to large corporate organisations; our gazebos have been used across a range of industry sectors. We are dedicated to building quality and durability into the products we make. We work closely with our own manufacturing facility which allows us to monitor and control the quality of all materials and components used in the construction of our gazebos, to ensure our gazebos and associated products are produced to the highest standards for lasting performance. Customer satisfaction is at the heart of everything we do. We allocate you a dedicated account manager, who takes ownership of our relationship as soon as you make contact. Whether it is for a single gazebo or multiple gazebos – this offers you the immediate benefit of having a single point of contact for all your queries and requests, from day one. We have been at the forefront of supplying digitally printed gazebos, since opening almost a decade ago. Our in-house design team will work with you throughout the entire process, branding your gazebo for great visual impact. Our sales and design team work hard to produce quotations and visuals within 24hrs of receiving your enquiry. Our plain, stock gazebos are available for next working day delivery to UK mainland. All orders need to be placed before midday for next working day delivery. Our standard turnaround for branded gazebos is between 7-10 working days. All our gazebos use a flame retardant material to BS 7837, B1 (Pass) ISO 6941 (Pass) for use at public events. The seams are multi stitched with heat sealed tape to ensure waterproofing. We won’t be beaten on price! We challenge any company to offer a like-for-like gazebo for the same price. Interested to find out more? 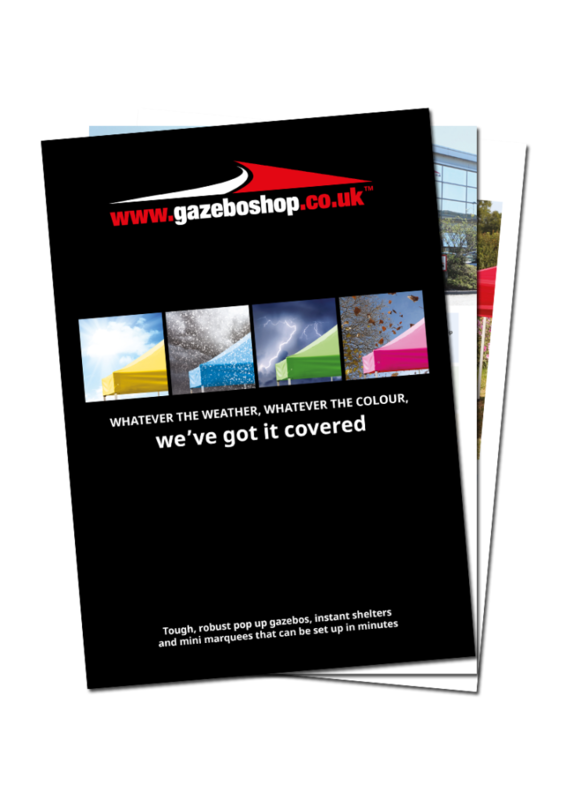 Call and speak to a member of our Sales team on 01295 258 922 or email sales@gazeboshop.co.uk. We will be happy to guide you through the process of choosing between our range of gazebos.